J.P. Morgan reiterates its overweight rating on Netflix and says its recent equity underperformance represents a chance to pick up exposure. Analyst Doug Anmuth tells clients uncertainty over whether Netflix subscribers will abandon the platform amid higher prices is overblown. "We believe the recent Netflix share price underperformance represents a good buying opportunity, and we recently added Netflix as one of our top picks," Anmuth writes. Recent underperformance from Netflix stock offers investors a rare chance to pick up exposure to the online streaming platform, according to J.P. Morgan Securities. 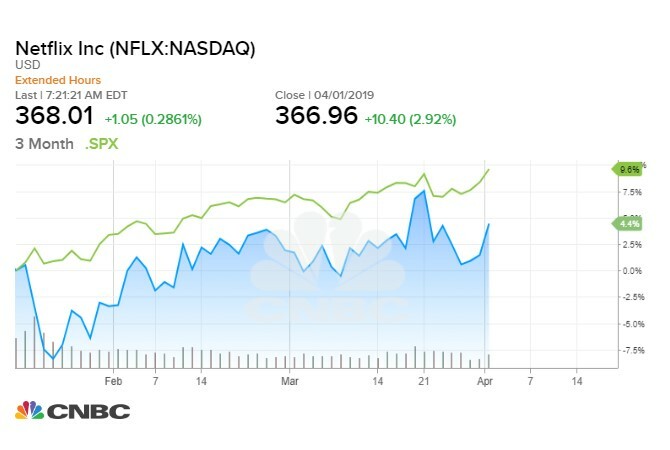 Analyst Doug Anmuth told clients that while the S&P 500 and other internet stocks have proven better bets in recent weeks, uncertainty over whether Netflix subscribers will abandon the platform amid higher prices is overblown. "We believe the recent Netflix share price underperformance represents a good buying opportunity, and we recently added Netflix as one of our top picks," Anmuth wrote Tuesday. "We believe the underlying secular shift toward on-demand entertainment remains strong, as does Netflix's original content slate, and the price increase and competitive launches could have less impact than expected." Netflix shares started the year with a pop but have underperformed since mid-January after reporting fourth-quarter results. The stock is up 3.9 percent from its close on Jan. 17, when it reported earnings after the closing bell. Anmuth believes Netflix is on track for more than 200 million global paid subscribers in 2021, an acceleration in U.S. revenues and better operating margins. He reiterated his overweight rating at $435 price target, which represents 18.5 percent upside from Monday's close.